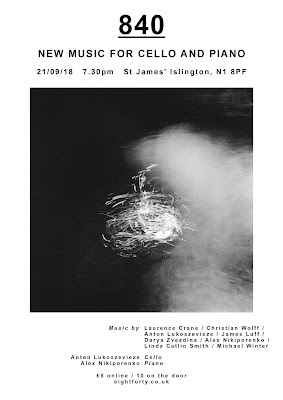 Cellist and inter-disciplinary artist Anton Lukoszevieze will perform new works for solo cello by Christian Wolff, Darya Zvezdina, James Luff and Michael Winter, as well as Laurence Crane’s gem from 1985, Five Preludes for Cello and Pianom at St James' Church, Prebend Street, Islington, N1 8PF on Friday 21 September at 7:30pm as part of the concert series, 840, curated by the composers Alex Nikiporenko and James Luff, which is dedicated to providing a platform for new experimental and minimal music. The programme will also feature Anton’s own What we really want to do is serve happiness, Linda Catlin Smith’s beguiling Ricercar and Alex Nikiporenko's 86 Permutations of Melancholia based on a magic square that appears in an engraving by Albrecht Dürer. Full details from the 840 website.